My living room has become one of my most favourite rooms in my place. Yep, it's very nearly beating the bedroom being my most loved room (and no, no dirty thoughts thanks..!). My bedroom is always the most calm of places, and a place I feel like I can relax the most. But since moving into my own space, I've managed to create that calming feel in my living room too. It's clean, and simple and gets a lot of light in. And is the perfect place to have friends over for drinks and a catch up. Saying that though, it doesn't stop me always online shopping, looking for new ways to decorate. Basically, new things to buy. Because, when you have your own place, you always want to buy homeware. Like the lot of it! 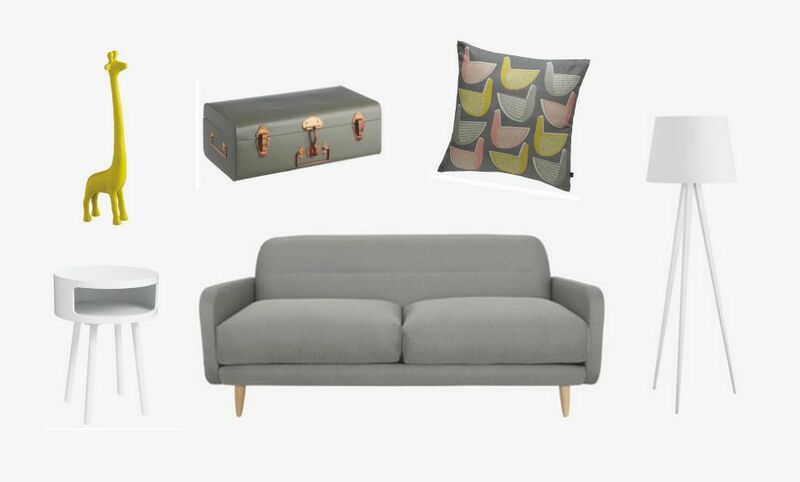 I've found myself lusting after a fair few things on Habitat. Their sharp yet practical pieces are drawing me in, and have my basket filling up a lot.OK, so maybe the Giraffe ornament isn't quite so practical.But LOOK, it's cute!And yellow. And it's fun.And well, I'm not really one for much colour, but I've found myself being partial to a pop of colour in each room. I love having plants in the house to bring some colour and life, and I think grey tones mixed with white's really make a room feel so much more relaxing. Yet inviting.Like the giraffe.Because he looks inviting.As does that Habitat Sofa. I could definitely become good friends with that sofa, and imagine whittling hours away watching Netflix and eating ice cream with it. I think we'd be a good pair actually.And I bet it would look even more super with a cosy throw. I sound like I'm starting a relationship with a sofa. To be fair... It is a nice sofa right?Why wouldn't you fall in love with it?Actually, I think I've fallen in love with Habitat.Not so sure my bank account will begin to appreciate them.. I think we may have a love triangle on our hands.